I ran zero miles this weekend. I haven’t run since Wednesday. I am not happy with myself. My training has gone been going really well and skipping two runs this weekend was not planned. Although I fully admit I should have been able to predict this problem. I went to Chicago for the Badger game. I got to see one of my college roommates who I miss terribly even though we now only live an hour and half apart. I got to see Maureen. It was like being back in college. We started drinking at 10:00am. This was not a good thing. I should know better. I am not 21 anymore. I do not enjoy feeling like crap. There is no reason to drink Miller Lite all day, ever, but I did. Eww. Although after the game I got smarter and just pretended to drink a beer for about an hour and then threw it away. After driving home on Sunday I was just plain exhausted so I told myself I could watch the rest of the Packers game (they won!) and then I would run. No, I watched the game and then I napped. And then it was raining. And then…I just gave up and went out for Sushi. I haven’t missed a long run in quite some time and am still pissed about it today. I really need to let it go, move on and continue my training. Missed runs happen. That is life. Missing runs due to my own stupidity needs to not happen again. I am worried about the weekend of October 1st so need to plan ahead and do my long run on Friday morning. Yay, no, not yay at all, but I need to get it done. With my fall race calendar I can’t fool around. I want to kill it at Army 10. I want to have fun at RnR St. Louis. All in all it was a great weekend. 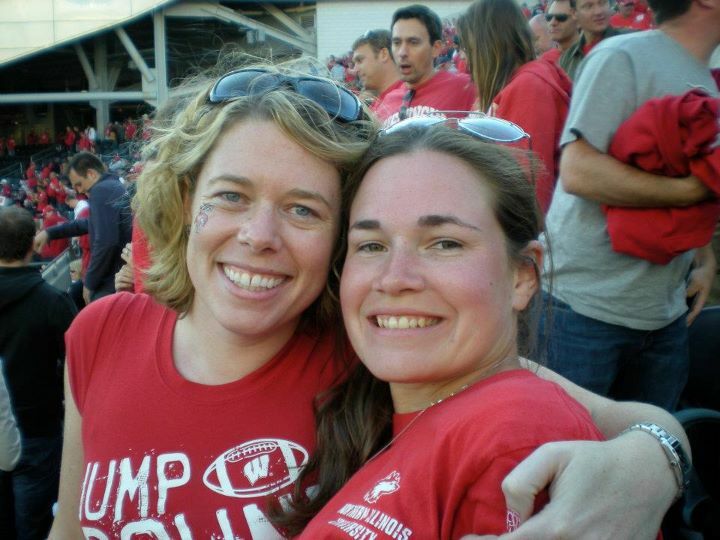 I love the Badgers, I love catching up with friends and miles will get run, eventually.